Does The MUSYSIC Complete Professional PA System Provide The Complete Approach That Users Expect? 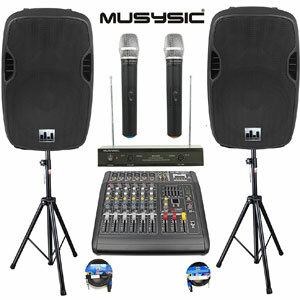 The MUSYSIC Complete Professional PA System is a system that claims to have everything that users need for a simple set up at their next show, talk or party. The key selling point here is the use of two 2-way speakers with 800w peak power and the 2000w built-in amplifier. In fact, it looks like a pretty substantial piece of kit with all those additional parts. Are users impressed with what they receive?